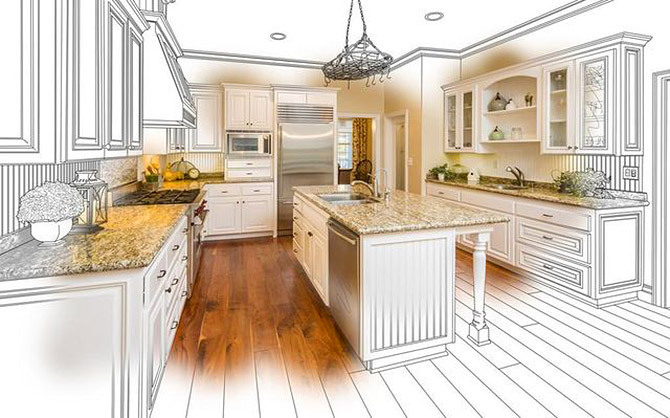 on Remodeling – but on What, Exactly? With the Great Recession now finally in the rearview mirror, many homeowners—and their bank accounts—are suddenly a bit more flush. And that’s good news for their homes sorely in need of more than a fresh coat of paint. Some new flooring, maybe? How about brand-new kitchen countertops? And while you’re at it, maybe an entire HVAC overhaul? Homeowners spent $361 billion—more than ever before—on home improvements, maintenance, and repairs in 2016, according to a recent report from the Joint Center for Housing Studies of Harvard University. That’s a nearly 13.5% jump from the previous peak, in 2007, just before the housing market crashed. The report looked at U.S. Census data on the 25 largest U.S. metros. Most of the data in the report was from 2015, except for the 2016 statistic on overall spending. “Homeowners just feel like they have more equity built in their home … so they can invest in their homes in bigger ways than they could in the past,” says Abbe Will, one of the contributors to the report. That’s because less unemployment, higher salaries, and rising home values are leading many homeowners to pimp out their homes, or at least fix them up a bit before putting them on the market. Renovations are also popular among new homeowners who want to customize their new pads. “A lot of remodeling tends to happen around the time of the sale,” Will says. So instead of only paying for things that need to be done, like replacing a leaky roof or repairing a cracked foundation, they’re creating outdoor oases and splurging on new granite countertops. Over the past few years, investors also spent a pretty penny fixing up residences they bought in the downturn to get them ready to rent out to tenants. What are homeowners spending money on? Spending may be back, but many homeowners still aren’t throwing money around with quite the abandon they did before the recession. In 2015, discretionary spending made up just a third of all home improvements—compared to more than 40% in 2007. The most common work done wasn’t exactly glamorous—necessary improvements such as replacing systems that keep a home humming along, like plumbing, electrical, and HVAC, took the lead, according to the report. This was followed by necessary upkeep on home exteriors, like roofing, siding, windows, and doors; interiors, like carpeting, flooring, and insulation; and improvements to lots and yards, such as fixing fences. Meanwhile, the most popular discretionary home improvements were bath remodels followed by kitchen remodels. Next up were outdoor living additions, like porches, decks, patios, terraces, garages, and carports, and then room additions. Baby boomers are leading the charge, with those 55 and up making up about 52% of the home improvement spending in 2015. That’s because many of them want to stay in their homes as long as possible, and they’re willing to spend some serious moolah to do that. Another area of growth is more energy-efficient and smart home renovations, remodels, and improvements. This can be anything from water-, power-, and cash-saving appliances to home technologies like the Amazon Echo. 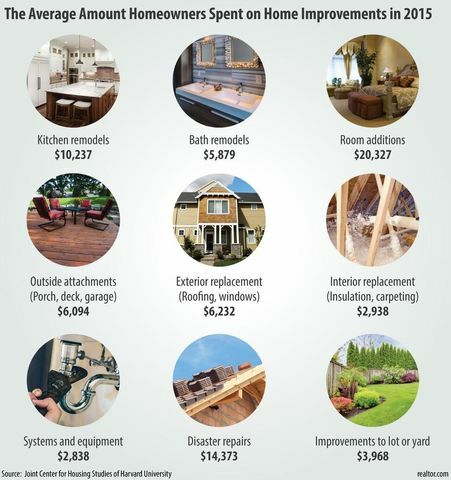 Who’s spending the most—and least—on home improvements? It shouldn’t come as a surprise that those under 35 spent the least on improvements—likely because they don’t have the higher incomes and equity built up in their homes, if, in fact, they own one at all. For example, homeowners younger than 35 spent an average $8,702 on their individuals projects in 2015. Those in the 35–44 age range spent $10,294, while the 45–54 age range plunked down $10,553. Homeowners in the 55–64 age range spent an average of $11,207, and those 65 and up spent $9,058. Those in their mid-30s to mid-50s spent the most, because they’re the most likely to have families. No one ever said kids come cheap! In the coming years, minorities are expected to spend more as well, according to the report. Their spending rose from 12% of the market share in 1995 to 19% in 2015. And that’s expected to grow by 40% to $60 billion by 2025. White homeowners are still expected to pay for the lion’s share of improvements, making up about two-thirds of the spending through 2025, according to the report. However, Hispanics are predicted to be about 18% of those seeking home improvements, followed by about 10% of Asians and 7% of blacks. The report doesn’t take into account recent changes to immigration policies that could affect the industry. 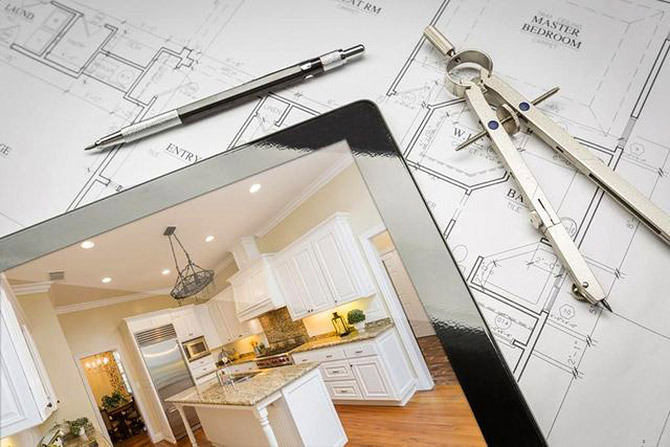 The future of remodeling is bright! Despite the surge in home renovations (new bathrooms! new kitchens! new patios! 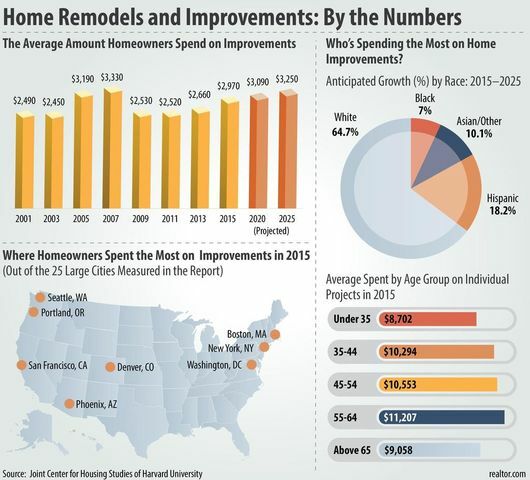 ), remodeling spending is expected to grow by 2% annually through 2025, according to the report. That’s a little lower than the 2.5% each year that homeowners paid from 1995 to 2015. Blame the anticipated slowdown on rising home prices and mortgage interest rates and not enough properties on the market to meet demand. That means fewer millennials will become homeowners. And if they don’t own homes, they can’t remodel them. However, when they do buy, their homes are likely to be cheaper and need more work. That’s expected to help drive the market in the future. “A lot of remodeling tends to happen around the time of the sale,” says Harvard’s Will.